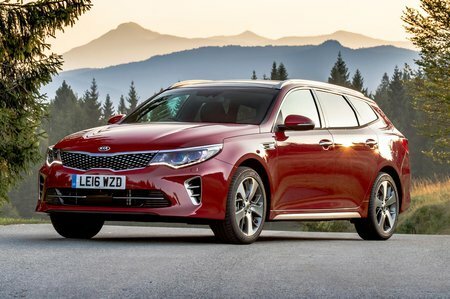 Kia Optima Sportswagon Interior, Sat Nav, Dashboard | What Car? The Sportswagon's interior has been given some improvements, including a new steering wheel and chrome trim on the centre console. It feels more polished than the Mondeo inside, thanks largely to its nicely damped switches and pleasant mix of materials. There’s a cracking infotainment system, too, with either a 7.0in or 8.0in touchscreen, depending on the trim you go for. Both screens are bright, while the menus are responsive and easy to navigate. Android Auto and Apple CarPlay smartphone mirroring are included as standard. Drivers of all shapes and sizes will be able to get comfortable behind the wheel. There’s a broad range of height and reach adjustment to the steering wheel, while the manually adjustable driver’s seat offers good variation. The electrically operated seats that come if you move up the range can be tweaked to an even greater extent, while all versions get lumbar adjustment as standard. 2 trim gets you black cloth upholstery, while 3 models include faux leather and the top GT-Line S gets leather upholstery with red stitching. The pedals line up nicely with the driver’s seat and steering wheel to leave you relaxed behind the wheel. Generally, the switches are clearly labelled and easy to reach, with just a few exceptions: the heated seat and steering wheel buttons are hidden down by the front centre armrest, and some of the climate controls – the ones to change the airflow from face to feet, for example – are embedded in the touchscreen, rather than on physical buttons. Visibility forwards is very good, although the view behind is more difficult to make out, due to the Sportswagon’s swooping roofline. Luckily, every version comes with front and rear parking sensors as well as a rear-view camera.